But lo! He and and his friends are on sale for 50% off! I tried to resist him, but had to go back. Why yes, Mr Owl, I think I’ll take you home for $25, thank you. He is currently getting cozy in my kitchen. 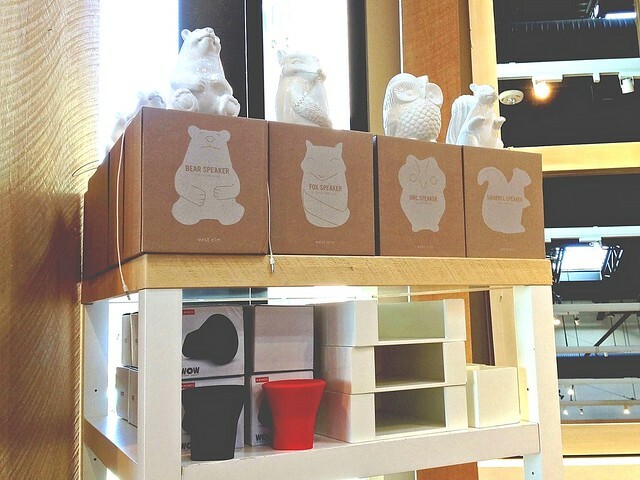 Doesn’t he look right at home with the other owls? 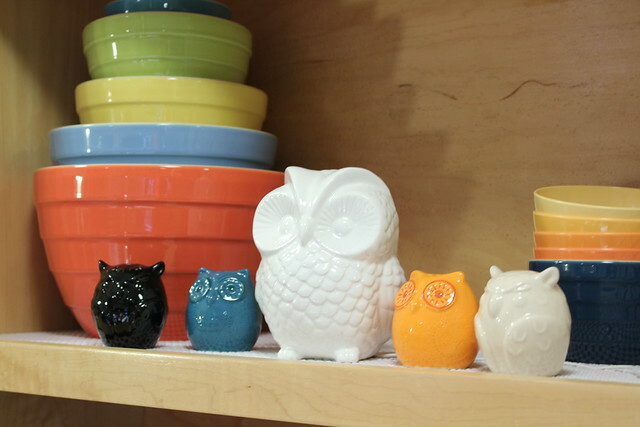 They’re salt & pepper shakers, if you’re wondering why I already have owls in my kitchen. I’m pretty happy with him and the amount of sound he produces. I should mention that the salesman at the store suggested I get one of the black or red speakers (which are on the shelf below the white ceramic animals). He said that they weren’t as cute, but the sound they produced was louder and of better quality. If that matters to you, it’s well worth knowing. I’m not an audiophile and don’t need an overwhelming level of music, so I went with visual aesthetics over aural. Plus, I think that this little guy might come in handy in Lil’Man’s room at times and cute animals go over big with the toddler crowd. When he saw the owl he started running around the kitchen hopping and hooting. It was hilarious. I think I made the right decision. Audiophile – love the fancy terminology! I love my iPhone docking station – but I DO NOT love the cord. I might have to try one of these animal friends! My kitchen counter will thank me. I really like our owl and I love that he doesn’t need to be plugged in AND he doesn’t need batteries (what little energy he needs, he gets from being plugged into your phone or iPod). He sits up on our storage shelves where there are no outlets. And, fwiw, the cord for connecting to your iPod is about a foot long, I think (it’s not handy for me to check right now).